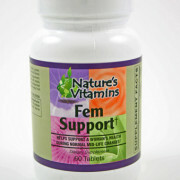 View cart “Fem Support” has been added to your cart. A comprehensive nutritional support formula designed to help provide women with support from symptoms often associated with life cycle changes. Contains Black Cohosh, Soy and Red Clover. These phytoestrogens, all natural components from plants, have a traditional history of use by women experiencing menopause related symptoms. Available in 60 Tablets.